New for 2013, the t25 arctic has been designed to be the ultimate tunnel tent for withstanding the very worst conditions on the planet. 1. SPEED. The t25 arctic is completely multi-pitch. In other words, it can be erected fly-first, inner-tent first, or integrally. Integrally, it can be pitched and trimmed in less than five minutes. 2. STRENGTH. The t25 arctic is made from the strongest fabrics, poles and components. Everything has been selected for strength, durability and reliability. 3. SPACE. The t25 arctic is wider than our normal 2-person tents to create the extra space needed in winter camping. It has a large vestibule at the front and a standard porch at the rear. 4. STABILITY. Wind is the true enemy of a tent. The t25 arctic has 20 guypoints, each one looping around the poles, to secure it in high winds. Despite its sheer size and muscular strength, the t25 arctic weighs in at only 4.20 kg. 18 g/m2, Dyneema/nylon non-woven fabric, 10,000 mm hydrostatic head. The arctic flysheet is made from nylon 6.6 with a yarn thickness of 45 denier. Almost twice as strong as fabrics woven from lighter yarns, this is the best choice for any serious mountain, expedition or polar tent. The strength of the arctic flysheet is further assured by using only high-tenacity nylon 6.6, which has a higher tensile strength than normal nylon. Finally, the fabric is silicone-coated on both sides for water resistance to a hydrostatic head of 7000 mm. The arctic uses panels of Cuben fabric in the porch areas to reduce weight, increase strength and allow some light to enter. Cuben is a fabric that was developed for the sails of the America Cup yachts. At almost a third of the weight of the 45d nylon, it has more than twice the strength. The downside is its cost – well over five times that of conventional nylon fabrics per square metre! The arctic groundsheet is made from a 40-denier nylon ripstop with a laminated thermo-plastic polyurethane (TPU) coating. TPU coatings have greater bonding durability (to the substrate fabric) and better abrasion resistance than conventional liquid-applied PU coatings. The t25 arctic uses 9.60 mm DAC Featherlight NSL poles. Quite simply, these are the most reliable poles we know. Pegs are a vital component of every tent. Tunnel tents are of course completely dependent upon solid anchors at front and rear, but a self-supporting geodesic, too, needs to be prevented from blowing away in the breeze. Lightwave offers a range of different pegs with the t25 arctic to ensure they can be secured in all ground conditions. Arctic tents come with our Dyneema guylines, a 2 mm blend of Dyneema and polyester with a breaking strain of 180 kg. Phenomenally light, they also absorb no water so won’t freeze up in winter. The Linelok adjusters mean they are easy to tension, even with gloves on. The t25 arctic is a multi-pitch tent. 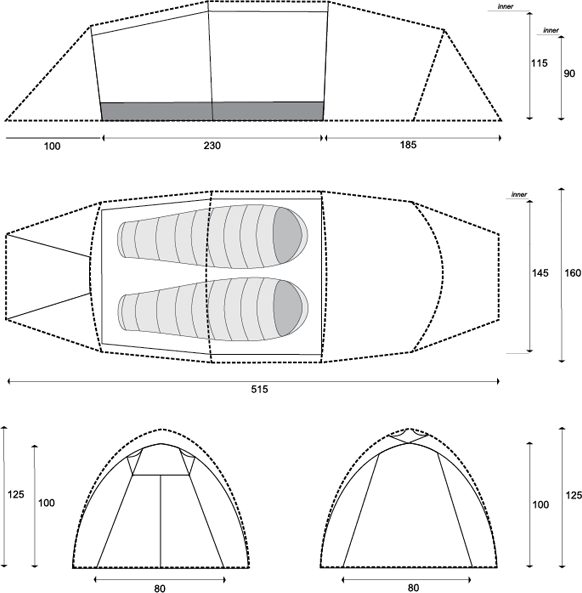 This means it can be pitched flysheet first, inner-tent first, or integrally with the flysheet and inner tent attached together. Pitching the t25 arctic integrally, with the flysheet and inner tent attached together, is the quickest and easiest method and can be completed within five minutes. This method is particularly advantageous in very wet weather.